A very special reveal at the Paris Motor Show today finally put the long string of "Project Anniversario/Retroquattro" rumors to bed. 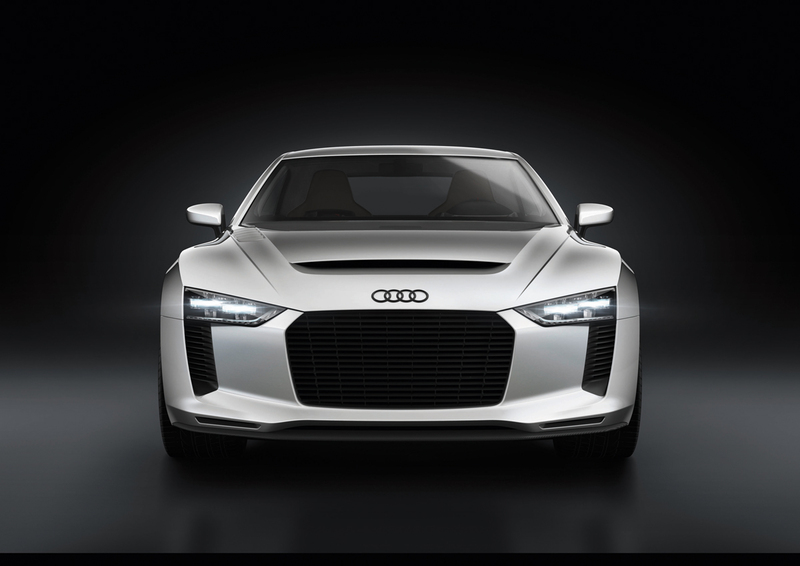 To help celebrate quattro's 30th anniversary, Audi has introduced the quattro concept. 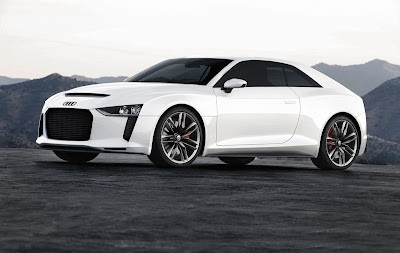 Based on a shortened RS5 chassis, the quattro concept packs a 408 horsepower, turbocharged 2.5-liter TFSI 5-cylinder derived from that of the TT RS. 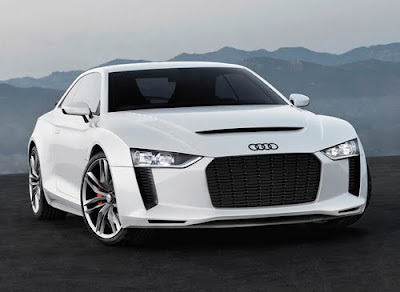 With nearly identical weight, subtly-retro styling cues and an updated turbo five 'banger under the hood; the Audi quattro concept pays homage to more than just the name of an iconic ancestor. Although A5/RS5 genetics can be seen in the quattro concept, Audi engineers shortened the wheelbase by 150 mm (5.91 in), lowered the roof-line by around 40 mm (1.57 in) and ditched the rear seats to not only give the quattro concept a more aggressive character but also substantially reducing the car's weight. 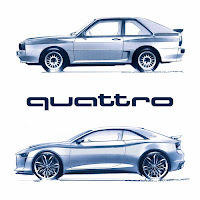 With a primarily aluminum construction and some carbon fiber components (hood and rear hatch), the quattro concept tips the scales at just 1300 kg (2,866 lbs), almost exactly the same weight as the 1984 Audi Sport quattro. 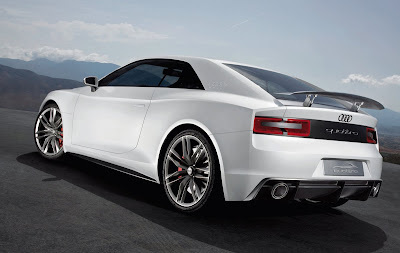 Under the hood, the Audi quattro concept boasts a turbocharged, 2.5-liter TFSI inline 5-cylinder derived from the TT RS. Unlike the TT RS however, the quattro concept's five-pot sits longitudinally, just like the old days. 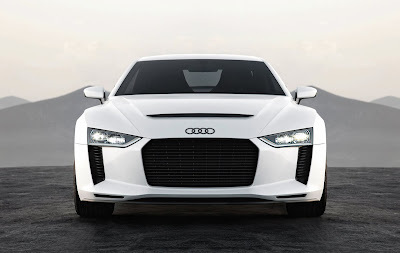 Tweaked to produce 408 horsepower and 354 lb/ft of torque, the quattro concept's impressive power-to-weight makes for a 0-100 km/h (62 mph) sprint in just 3.9 seconds all while averaging a surprisingly frugal fuel consumption figure of 27.67 MPG. Of course, carrying the name "quattro" means superior handling and grip must truly be at the forefront. Making use of both Audi's sport rear differential and crown-gear center differential, the quattro concept features the latest evolutionary stage of the quattro permanent all-wheel drive system. So, will we ever see the Audi quattro concept become reality? We certainly hope so. 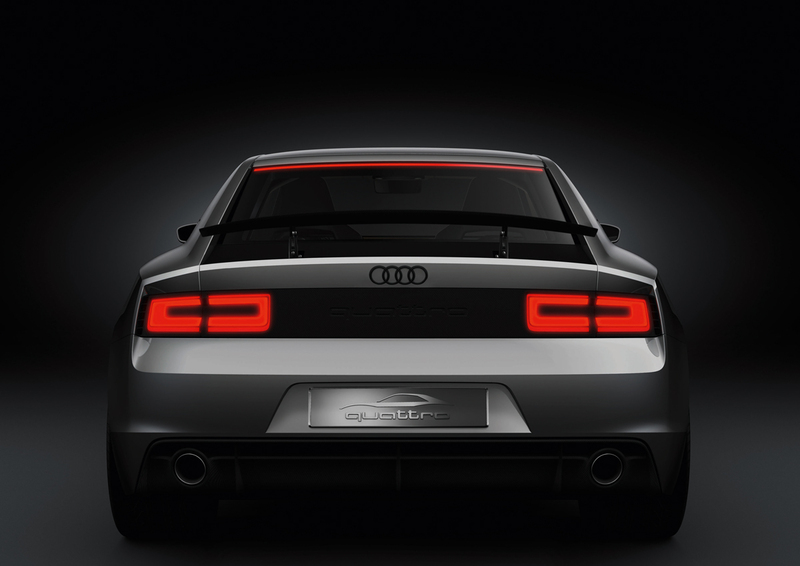 The quattro concept's styling, construction, and powerplant are certainly within the realm of production-ready reality. While the quattro would most likely never see mass production, a limited-run, special edition would not surprise us one bit (like Porsche's new 997 Speedster). Petition please? For the full run-down of facts and figures, check out the official Audi press release following the photo gallery. The very first glimpse of the new Col de Turini White show car awakens memories of another legendary ancestor: the 1984 Sport quattro, a 306 hp evolutionary stage of the Audi quattro Coupé with a shortened wheelbase. 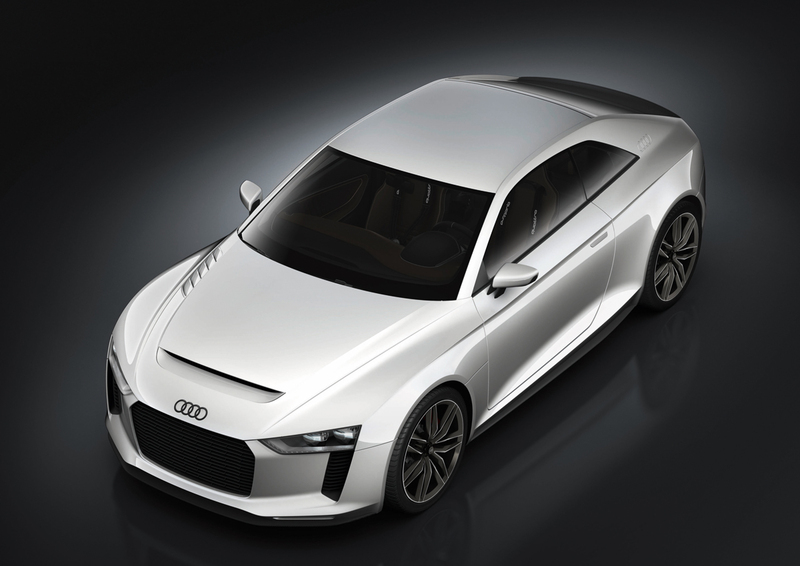 In fact, the Audi quattro concept also represents the systematic further development of a production coupé using high-performance technology. The foundation is provided by the powerful Audi RS 5, one of the brand’s sportiest production vehicles ever. The low weight of the superstructure leads to significant secondary effects in other components of the vehicle, such as the transmission, the chassis and the brake system. As a result, the Audi quattro concept weighs just 1,300 kilograms (2,866.01 lb), almost exactly the same as the Sport quattro from 1984. This once again moves Audi, the pioneer of lightweight construction, to the head of the pack. The know-how and technologies of the quattro concept body will characterize Audi’s entire production model portfolio in the future. In another move that benefits the vehicle’s weight, the eight-cylinder engine from the production model has been replaced under the hood by a turbocharged, inline five-cylinder engine that can trace its roots back to another Audi sports car – the TT RS. 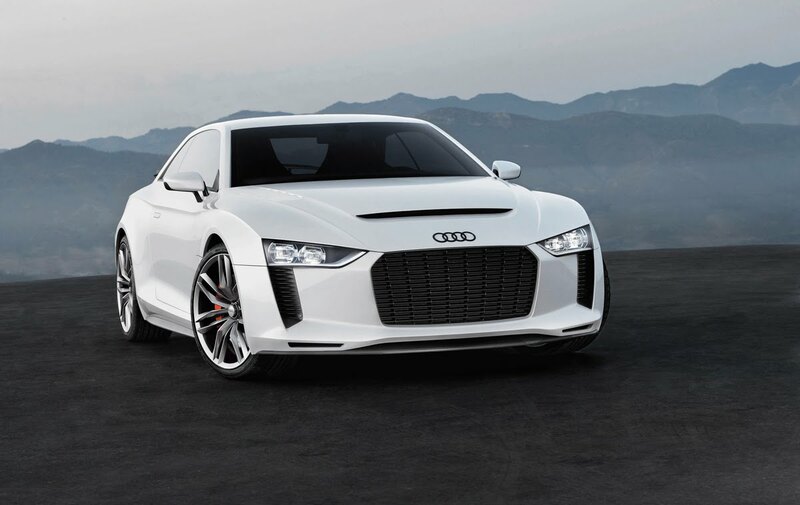 In the Audi quattro concept, the longitudinal FSI turbo produces 300 kW (408 hp) and accelerates the car from 0 to 100 km/h (62.14 mph) in only 3.9 seconds. Torque is distributed as needed via a six-speed manual transmission. The Audi quattro concept uses the latest evolutionary stage of the quattro permanent all-wheel drive system to deliver its power to the road. The key innovation, the crown-gear center differential, is compact, lightweight, and can vary the distribution of power between the front and rear axles over a broad range, enabling the quattro drive system to react within milliseconds to coax the maximum of fun and safety out of every last bit of torque. 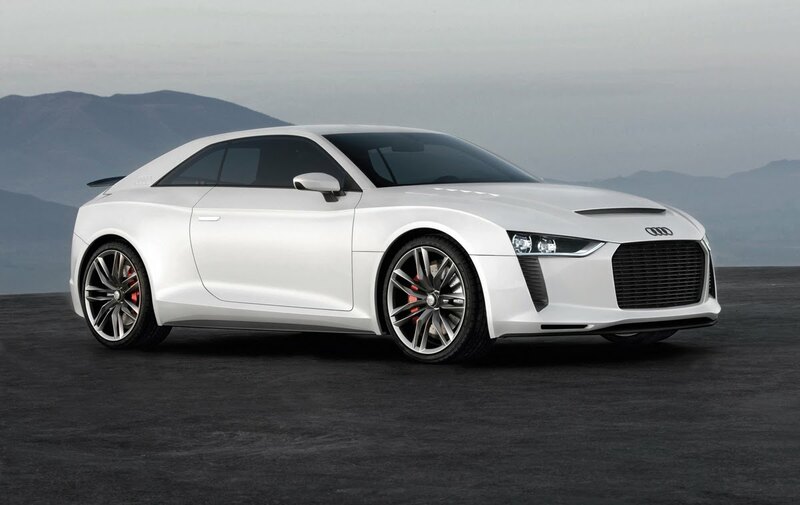 Brawny, compact, powerful: The appearance of the Audi quattro concept makes no secret of its potential. Although the genes of the elegant Audi A5 and RS 5 Coupés are impossible to overlook, the appearance of the show car is far more aggressive and extroverted. Even the obvious differences between the base model and the evolution are more dramatic than between the Ur-quattro and the Sport quattro in 1984. Awaiting the driver is a clearly organized workplace that exudes quality from its carbon surfaces and upholstered leather inlays. The color scheme with satin black for the carbon elements and rally beige for all of the leather areas offsets the various functional units from one another and emphasizes the handcrafted character of the interior. 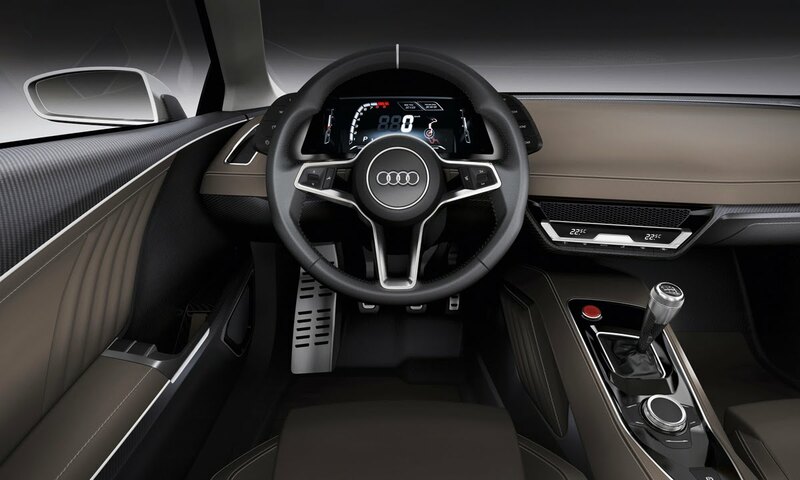 The classic driver orientation (“wrap-around architecture” in the designer jargon) of the cockpit is typical Audi. The control unit for the MMI touch system and the shift lever for the six-speed transmission are located on the extremely slender center console. The instrument cluster is completely digital. The large, three-dimensional visor-like display contains all of the information required by the driver and thus also replaces the classic MMI central display. The clear graphics, the stark black-and-white contrast and the subtle red highlights are precise and modernly interpreted – an indicator instrument for a driving machine, with no superfluous touches. The driver has the choice between an everyday mode, which combines the indication of the speed and engine revs with the content of the MMI, and racing mode, whose graphics revisit and refine the digital instrument of the Ur-quattro from the 1980s. The driver will find another reminder of the Ur-quattro's cockpit on the sides of the cockpit cowl: On both the right and left sides are four flat buttons. The ones on the left control the stopwatch function in racing mode, and the ones on the right are for the menu of the MMI system. Entertainment is offered not just under the hood, but also in the form of digital media. A customizable web radio can use the driver’s cellular phone to connect to digital radio stations all over the world, if desired, for a sheer endless array of genres and musical styles. Playback of the driver’s own files and playlists is also supported. Communication also benefits from access to corresponding online services. Whether the online address book or the driver’s own cellular phone, the MMI combines all data into a single view. Contacts are always available wherever the user happens to be. To pay proper respect to the Ur-quattro as the winner of numerous rally world championships, a so-called “prayer book” – the classic rally copilot's track description – can be displayed in racing mode. It provides precise information about the route ahead for an authentic rally feeling – even if a copilot is not available. The power-to-weight ratio of 4.3 kilograms (9.48 lb) per hp already says a lot about the car’s dynamic potential. It is on par with that of the 525 hp Audi R8 V10, a veritable supercar. 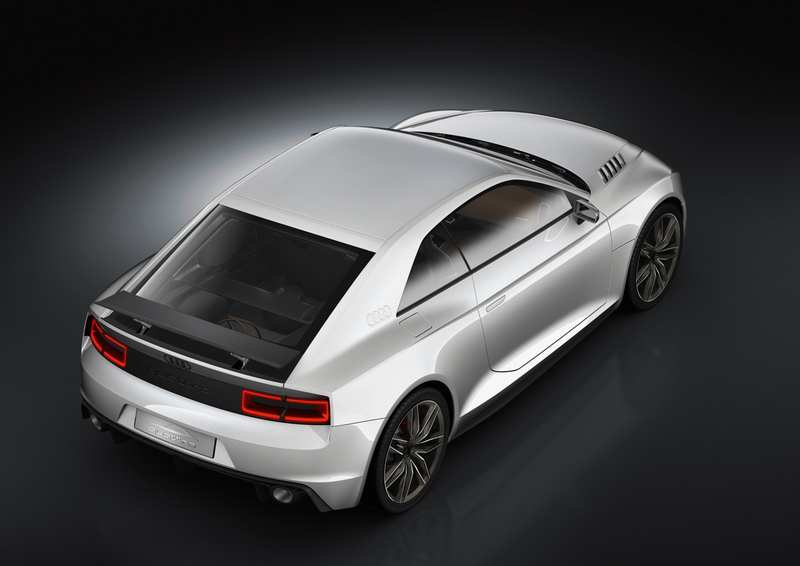 The quattro concept also has a much better power-to-weight ratio than its Sport quattro predecessor. 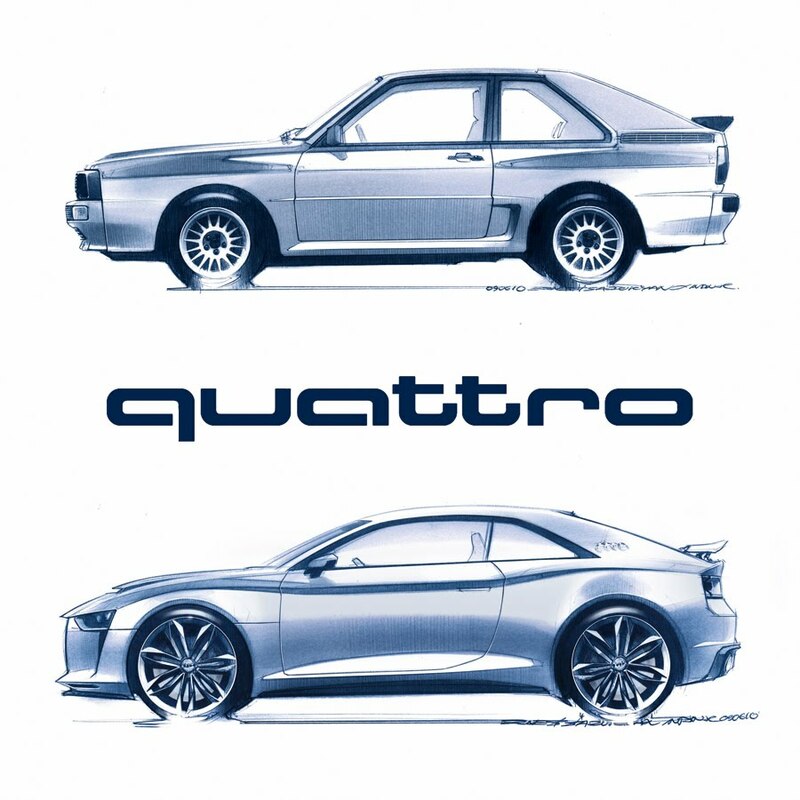 Although the Sport quattro weighed the same, the production version of its five-cylinder engine only developed 306 hp. The 2.5 liter TFSI is extremely compact. Its cylinder spacing measures 88 millimeters (3.46 in); the external main bearings were moved inside. Only 494 millimeters (19.45 in) long, the long-stroke engine (bore x stroke 82.5 x 92.8 millimeters [3.25 x 3.65 in]) is suitable not only for transverse installation in the TT RS, but also for longitudinal installation in the emphatically short front end of the Audi quattro concept. 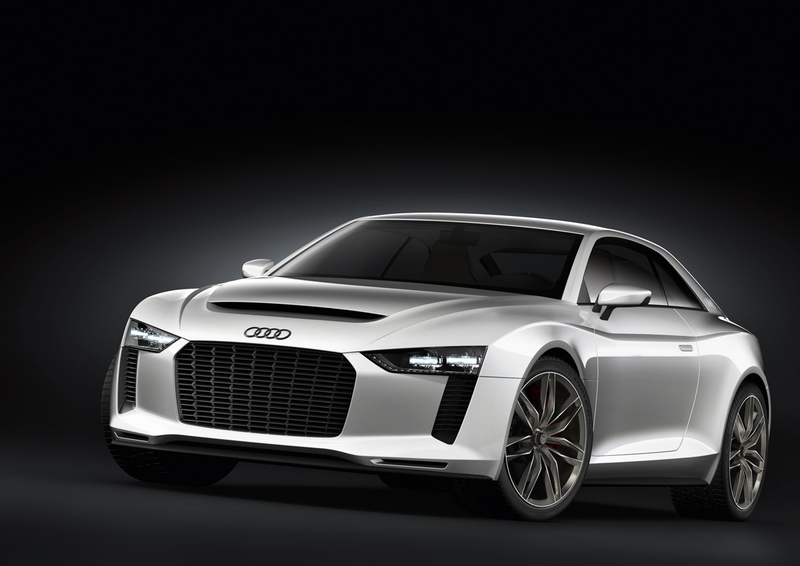 The high-performance Audi quattro concept dazzles with extreme driving dynamics. It reacts without hesitation, almost reflexively. Its handling is uncompromisingly precise; its stability guarantees maximum driving safety. The steering connects the driver with the road to provide sensitive, finely differentiated feedback. The wide tracked chassis is rigorously tuned for performance. All of the key suspension components are made of aluminum, thus reducing the unsprung masses. The springs and dampers of the track-controlled trapezoidal link rear suspension are separated to improve response behavior. The links are mounted on a steel subframe on elastic bearings. The five-link front suspension processes the longitudinal and lateral forces separately. The rigid aluminum frame to which it is linked makes the front end extremely rigid. Up front are anthracite gray, drilled carbon fiber-ceramic discs. They are gripped by red-anodized, six-piston fixed calipers. The ceramic discs are practically fade-free, extremely robust, powerful and durable. Furthermore, they are four kilograms (8.82 lb) lighter than steel discs despite their size. 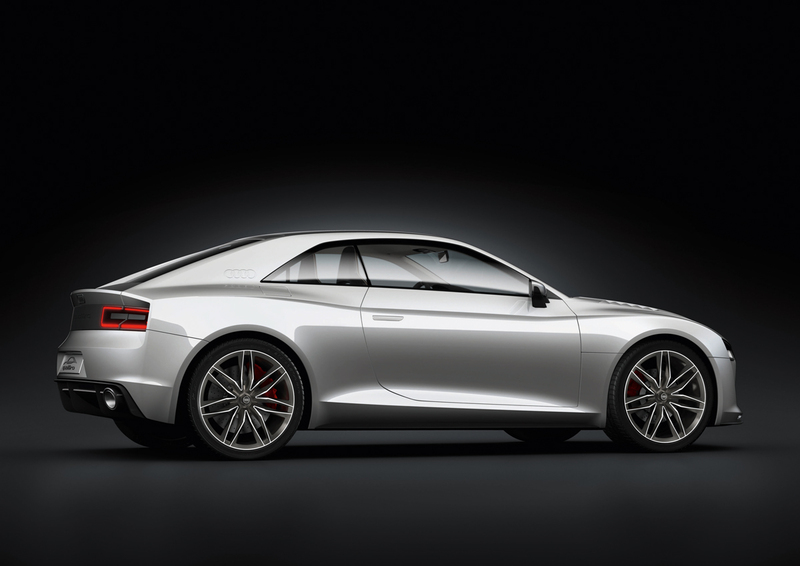 The Audi quattro concept rolls on large cast aluminum wheels in seven twin-spoke design. The 9J x 20 wheels are shod with 275/30 tires. Like the Audi R8 LMS GT race car, the wheels of the Audi quattro concept have a central locking mechanism for fast changes.